I'm contacting after being interested in your blog. I have been composing music for a very long time now, and I appreciate so many things about your blog and your songs. I am from Srirangam and I compose music for purely passion sake with all my heart. I currently live in Singapore now, far away from my homeland. Unfortunately, I am unable to convince my parents to pursue a full-time career in music. My dream is to be making the music I like and most importantly continue on a musical journey for the rest of my life. I hope that I can achieve this aim by working in the Indian movie industry as I am amazed by so many works just like I am with yours! If you could help me out in anyway possible, please let me know. Please tell me if you are willing to help me on my journey in any way possible! Do you only compose or you can also sing? You are an "entity" on earth by yourself. God put you here for a purpose. You only get a glimpse of what that is. You are lucky to have found your passion. 99.99999% of people that might include your parents have no clue about their own "purpose" on earth. Listening to their advice or convincing them is meaningless. YOU have to live your life. Let them not put you in a mould in which you don't fit. You will always feel uncomfortable. This is Partheepan from Sydney got your contact from one of my friend here in Australia. We conduct musical competition like supper singer in India every year in Sydney. This year also we are planning to have in Aug 2014. We are from a charity organisation non profit college alumni from Jaffna Sri Lanka operating in Sydney. 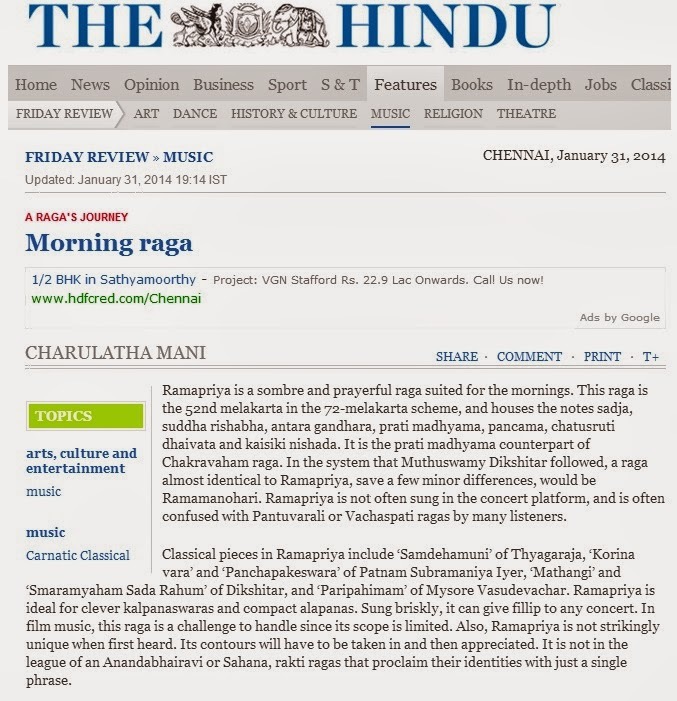 I greatly appreciate your voice and style of Carnatic music rendering. I recently discovered you as I was surfing youtube trying to discover new music links. You can count me as one more fan. Your singing of 'Etavunara' in Kalyani is really superb. Recording of this piece and the accompaniments seem to be quite good also. I am listening to this over and over again. I am completely mesmerized by it. Your Bajarere manasa in abheri is quite good also. Please add many more of your clear recordings under 'music' links. I would to ask you a question on music now and then. I hope you would not mind such questions. Can you please briefly explain why 'e tavunara ' and 'nidi chala sukama' sound differently at least a bit though both are in kalyani raga? Your film song 'kannukkul pothivaipen' is superb. Abang dalitakantita comes out beautifully also.